A breathless chase down a hallway. Echoing laughter and the whirring of a sawblade dogging your steps. If you’re brave enough to look behind you, you’ll see the maelstrom of body parts that make up the monstrous creature known as Guardian. Aside from a handful of brief glimpses in trailers, the recent hands-on demo for The Evil Within 2 was our first real up-close-and-personal encounter with Guardian, and those headed to PAX West will be next in line to meet her. Check out the full encounter from early in the game in this video. 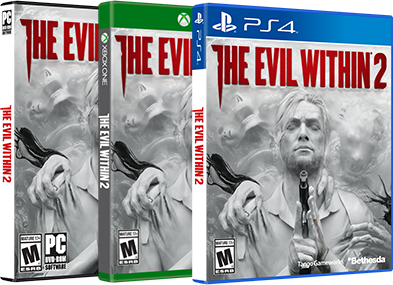 Are you ready to face off against Guardian and the many other horrors waiting for you in The Evil Within 2? This chase is just a snippet of what players have experienced in the hands-on demo. You can see our exploration of one of the game’s haunting locations here and check out some press impressions below. The Evil Within 2 releases on PlayStation 4, Xbox One and PC on Friday the 13th this October. As Sebastian Castellanos, you’ll have to dive into hell once more in the sequel to the hit 2014 survival horror game from the mind of Shinji Mikami. Take on twisted creatures in horrifying domains and face off against your own worst nightmares as you race to save your daughter.